When I first began digital marketing years ago, perhaps I was one of the ‘rare lucky’ ones, or at least when it comes to most companies & businesses. I came from the world where my marketing funnel went from Top of Funnel (TOFU), Middle of Funnel(MOFO), to Bottom of Funnel (BOFO). At which point if the potential lead was considered a true lead – and at the ‘BOFU’ they were passed on to the dedicated sales person. Otherwise, as a marketer, it was my job to continue to nurture and work with them through the process to make them become a ‘BOFU’ worthy lead. Yet for many business owners, companies, and the like – when generating leads in the online world, it’s hard to know when to shift that ‘marketing qualified lead’ (MQL) to a ‘sales qualified lead’ (SQL), and how to give both credits. Even more so, it’s hard for many to grasp the concept that inbound marketing goes beyond just the initial lead generation. Inbound marketing is absolutely about connecting, collecting, and generating leads. We as inbound marketers are drawing people and leads to whatever company and business through many avenues – paid, social, content, etc. However one of the biggest components that are often misunderstood by business owners is the fact that as inbound marketers, we continue to nurture leads. Whether it’s sending follow-up leads. Or it’s actually placing that phone call (which heck, I don’t like to do, but I often do just so I can know why a client may think not or share how we can be the best option!) It’s about continuing the conversation far past the point of a form fill out at day one. Inbound Marketing is far past the point of filling out a form. Sure, I’ve gotten a lead, WOOHOO! I can pass it on to my sales person and count it towards whatever my target goal may be. But are they converting? Are they becoming a sale? Are they becoming a client? Are they becoming a client? This is the most important question to ask and to have answered – and why it is so important that sales and marketing teams work together (aka smarketing). Because if perhaps a typically qualified “MQL” that turns into an “SQL” but then does not end up becoming a SALE – should you just drop the potential lead? Of course not! However! This means that your sales team and marketing team must be hand in hand in communication and efforts. Perhaps the lead didn’t sell this time. Well, your sales team should tell your marketing team to continue their nurturing process so that perhaps next time, they do become a sale. That’s not just a win for marketing or sales, that’s a win for the business. Marketing can’t help Sales without Sales helping Marketing! The point of all of this is this: if marketing passes on a potential lead to sales – but is failed to learn about the follow-up connection – whether that person became a lead or not: why that person DIDN’T become a lead or not, etc. There’s a huge missed opportunity for all. Marketing cannot continue to potentially nurture the nonqualified lead in the future, that could have become a SQL (sales qualified lead). Marketing is missing opportunities on potential content, conversations, and failed to potential examples of clients as case studies – all of which reinforces the circle of the success of sales and marketing working together. The point that I am trying to make – and any marketer and salesperson together should ever make, is that there needs to be a ‘smarter’ approach. A written, defined, understood way to what happens to each lead that comes through the funnel. No marketing funnel stops at the top – no matter what, just like no sales funnel ends at the bottom. Sales and marketing must be a collaborative force, that works together, to better achieve not just their own goals – but the goals of the businesses they represent. If you don’t already, you need to subscribe, follow, read and watch Gary Vaynerchuk on anything and everything. I know for me, personally, I hit a link – a blog – a website – and if it’s informative enough, or seems ‘hip’ enough – I’ll usually follow through on their immediate ‘call to action’ (as every inbound site of course has, right?) and give them my email address, and subscribe to their newsletter. By the 2nd round of emails (if I even make it past the first email they send) – I’m 99% likely to hit that unsubscribe button. While they drew me in enough to get me to give them my email – they have failed to hold my interest. Whether it’s because their emails are boring, they failed to correctly personalize (i.e. my experience with Ebates.com), or whatever reason – VERY FEW newsletters that I sign up for, do I ever read the first – even fewer make it past the 2nd email. Gary Vaynerchuk is one of the VERY few that passed that test. In fact – even my ‘marketing idol’ (inbound marketing hero? Digital marketing expert? Whatever you want to call the amazing Seth Godin); I don’t subscribe to his emails. The amazing Gary Vee recently sent an email out… sharing an old video he once did, titled ‘One is Greater than Zero‘. If you haven’t watched it; watch it now! But this is something I have been ‘doing, believing, and preaching’ for years. Because while I measure everything (after all, I’m an inbound marketer! ), I purposefully do not focus on the amount of views or leads or comments or shares or retweets or bounces or anything on my own personal domain. Because, I know that whatever I am doing? It’s working. It may not be going viral – but it is helping those who may not know much about digital or inbound (i.e. my most successful posts have been the ones where I wrote merely tips to help businesses grow; i.e. 6 Steps to Organically Growing Your Social Media Following or (Competitor) Ignorance Ain’t Bliss Honey… or What is “Inbound Marketing” aka – “Sell Me This Pen” or Stalking Not Necessary… How to Stay on Top of Your Competition!) I didn’t write those to attract, or count, or convert or build an empire – I wrote those merely to share and help others. Others who may never become clients. Others who may never spend $1 with me. But I wrote it for them – and not for my own purpose, not for my own numbers, not for my own gains. And yet, those (and other similar blog posts) are the reasons I’ve landed new clients. Are the reason I’ve attracted employers and opportunities that I thought were “way out of my league”. And yet – I write other posts – where only 1 person reads it; and they even bounce. Or I get 10 visitors, and only 1 comment. Or I get no comments. Because ‘The Power of ONE’ is influence enough. Maybe that ‘one’ will become my next huge client. Maybe that ‘one’ will refer someone to my blog, or to me. OR maybe, just maybe that ‘one’ was about to give up on their business – on their own success and growth – and instead learned something unique and valuable enough to help keep them going. 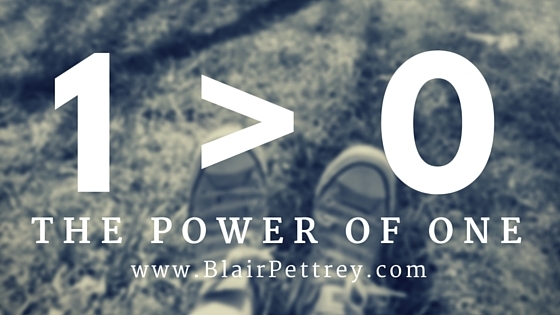 Don’t write or create content merely for the numbers. I promise you – if what you share is valuable – you will get more than 1. But even if you write the most AMAZING blog post, even if you create the most AMAZING video, graphic, ebook, etc – and it only gets 1 view/click/download – you never who that ‘one’ is. And ONE is GREATER than ZERO! The reality? The best place to hide a dead body? Page 2 of Googlesearch. 80% of people don’t look past the top 3 results on Google, 90% don’t look past page 1. Where does your business’ page land?